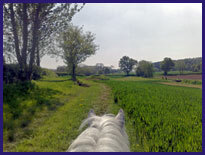 Worcester riding School is based within the beautiful rolling Worcestershire countryside. 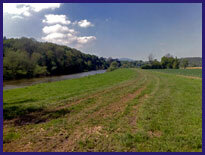 We are fortunate to have access to over 300 acres or private riverside farmland. Unrivalled locally for our hacking and out riding, we are able to offer the experience of the breathtaking views alongside the river Severn. Riding through the ever changing farmed land as the sun is setting is certainly one of life�s little treasures. We are unique in being able to offer these rides and even inclimate weather is not enough to spoil the experience. We are very lucky to have direct ridden access to the local pub in Severn Stoke, the Rose and Crown. The very popular pub hacks takes you alongside the river and directly to the pub, these hacks are ideal for a celebration weekend, birthday treat or as a mother/ father daughter/son bonding exercise - who could resist the prospect of having a refreshing drink at the end of a ride. 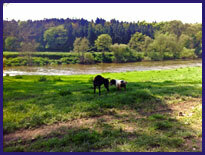 All off our hacks are off road - no nasty traffic to contend with, and over private land.